Good Vibes is more than just a fitness studio. It is a place dedicated to the enjoyment that positive, fun and thoughtful exercise creates. We are not anonymous or corporate, instead we hope to inspire people to exercise because it’s better for their minds as well their bodies. So coming to our classes will make you fitter, but they’ll also make you happier too. We’re small but we’re perfectly formed with a studio for Power Plates, Glow Yoga and Glow Cycle. We love the atmosphere that the sociability of great classes creates and firmly believe that feeling fantastic is about generating positivity and joy together, not working in isolation. We’ve gone to great lengths to create spaces that are a pleasure to be in and help you to get the most from your class. So that means Europe’s first infra-red studio, to maximise the benefits for your mind and body, and it means a look and feel that you wouldn’t normally expect from a ‘gym’, like wooden panelling, swooping murals and a dash of joy . It doesn’t mean row upon row of people doing their own thing. 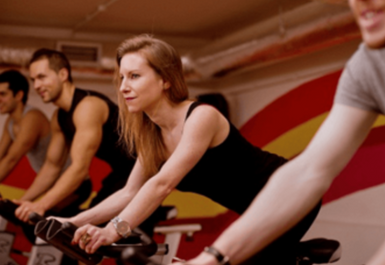 Glow Cycle to get your heart racing and the endorphins pumping!